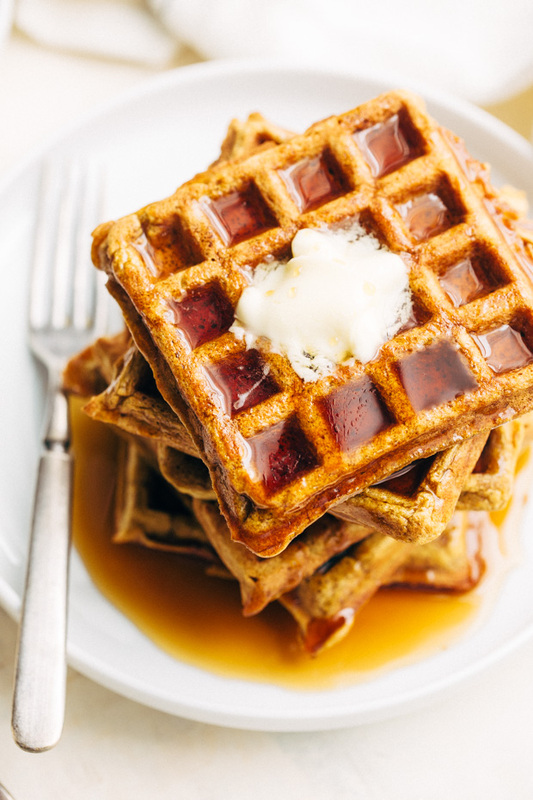 An easy recipe for buttermilk pumpkin waffles. 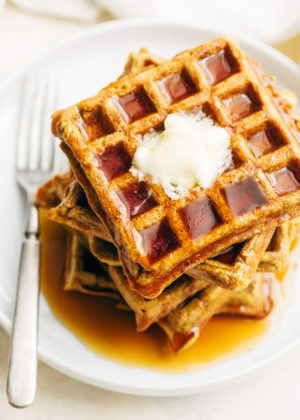 These buttermilk waffles are crisp on the outside and loaded with fall flavor! Great for Sunday breakfast! Next level breakfast right here. We’re talking about the most delicious, fluffy spiced pumpkin waffles you’ve ever had. This is what the weekends are all about. While you take a back seat on life and just let these buttery waffles guide the way. A generous pat of butter and real maple syrup just cascading off the sides. 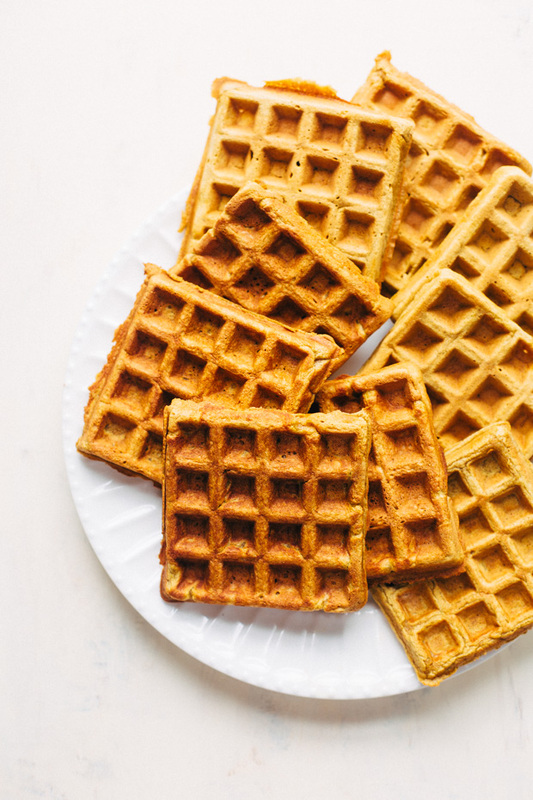 If we are anything alike, you certainly don’t need a lot of convincing when it comes to pumpkin-anything but these waffles? Can we just say that they are re-donkulous. Sunday mornings in this house are all about leisure if/when possible. Between the hustle and bustle of the week it’s important to take out a little time for yourself. You know, an extra cup of coffee while you’ve got your favorite morning Spotify playlist on in the background, just enjoying the last few minutes of zen time before the chaos hits. Or just allowing yourself to let your mind wander while you whip up a quick batch of the fluffiest whole wheat pancakes  because you’re one of those people that finds the art of cooking to be soothing. When the weather starts to turn cold and gloomy, these pumpkin waffles almost always make an appearance in our home. I realized the other day that though we make waffles on the regular here, i’ve never really shared a waffle recipe with you. When we first got married, I purchased a super cheap $10 waffle iron from Macy’s on Black Friday. The thing made some pretty, shall we say, interesting looking waffles. Something was seriously wrong with the heating element because the thing had horrible hotspots. But no matter. This was around the time when everybody and their mama was using store-bought brownie mix to make brownie waffles in the waffle iron. Seriously though. Have you tried it? ILYSB. Especially with a mound of vanilla ice cream on top and a sprinkle of sliced almonds for a little crunch. You make my LIFE. Over the years, I managed to make that rickety waffle iron work because my love for waffles is just a bit ludicrious. But a few months back I finally caved and invested in a real, adult waffle maker . And man, never have I felt so guilty cheating on my other number 1 kitchen appliance, the electric pressure cooker . Don’t make me choose which one I love more. It’s too hard. 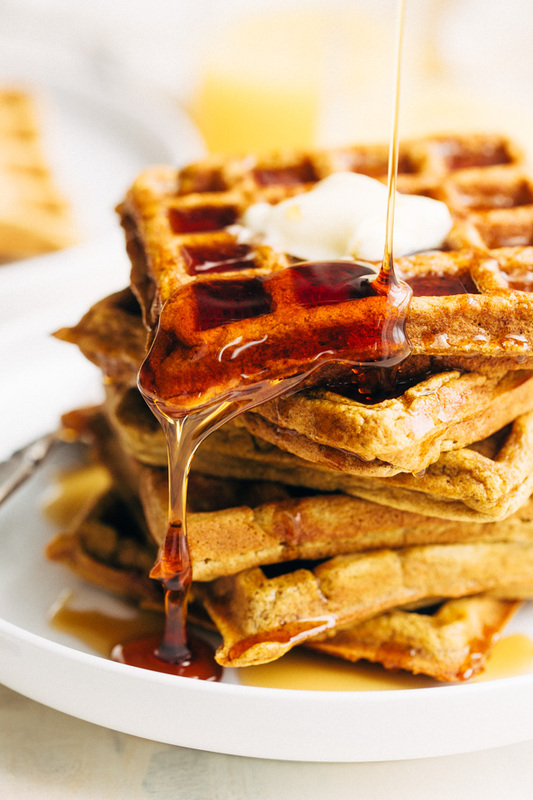 Let’s talk pumpkin waffles. This is seriously my absolute favorite way to make waffles in the cooler months. Adding cinnamon, nutmeg, ginger, and vanilla all adds so much warmth to the weekend breakfast scene. These waffles are golden brown on the outside with crisp edges and tender centers. They’re fluffy and packed with so much autumn flavor in every bite. My homemade waffle recipe is as simple as it gets. In a medium bowl we’ll combine all of the dry ingredients. A little flour, baking soda, baking powder, salt, brown sugar, cinnamon, ground ginger, and ground nutmeg. Give it a whisk. 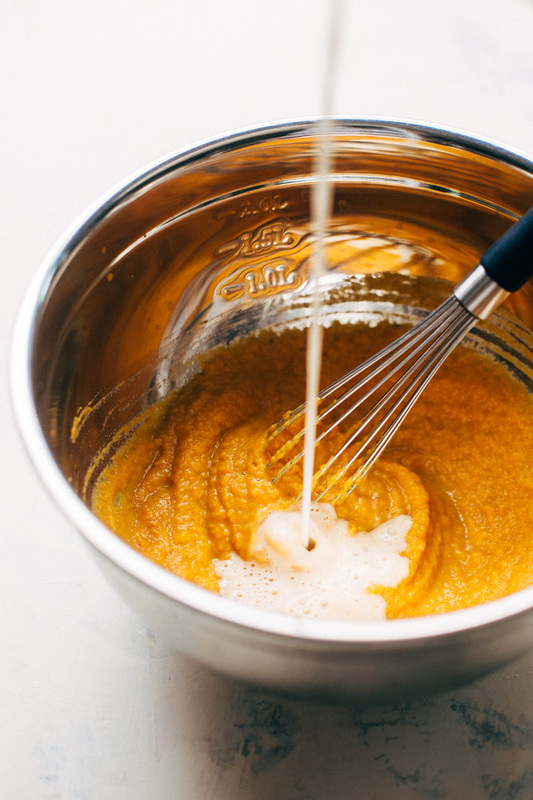 In a large bowl we’ll whisk together three eggs, melted butter, buttermilk, pumpkin puree, and vanilla. Then it’s as simple as adding the dry ingredients to the wet ones and combining with a rubber spatula until *JUST* mixed. Keep in mind, the more you mix, the tougher the final product so don’t overwork that batter! use butter. It just makes everything better. yes, buttermilk is necessary. And no, unfortunately milk + lemon/vinegar isn’t a good substitute! This recipe, for some reason, just doesn’t like homemade buttermilk. You’ll need the real stuff for this one. BUT BUT BUT, it does however work with regular milk/almond milk/ and coconut milk. So if you don’t have buttermilk but still want these waffles, sub it for regular milk. Keep in mind it will be missing a bit of that rich, buttermilk flavor though. But in a WAFFLE EMERGENCY, you can certainly use regular milk. cook the waffles low and slow. 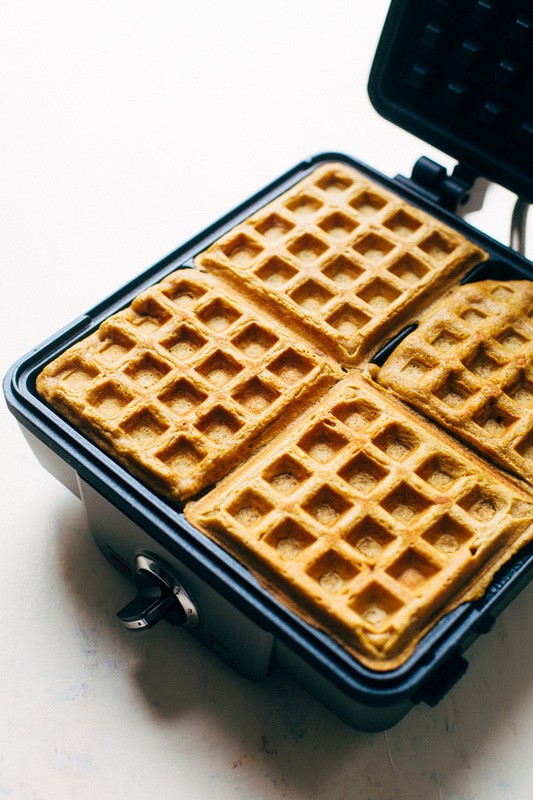 These pumpkin waffles require a little bit of extra waffle iron time. My trick is to set it on the lowest heat setting, let it go once. Check on them, and then let it go a second time. I find that this method really produces waffles that are nice and crispy on the outside while maintaining the moisture for softer, more tender centers. keep the oven preheated to 200ºF. There’s nothing worse than the cook getting cold waffles. Whamp. Take it from someone who’s had this happen, you want to transfer the waffles to a baking sheet and let them stay nice and warm in the oven. That way, everyone gets a piece of the warm waffle action! Top your homemade waffles with maple syrup, whipped cream, or if you’re super fancy, maybe a little whipped honey butter? 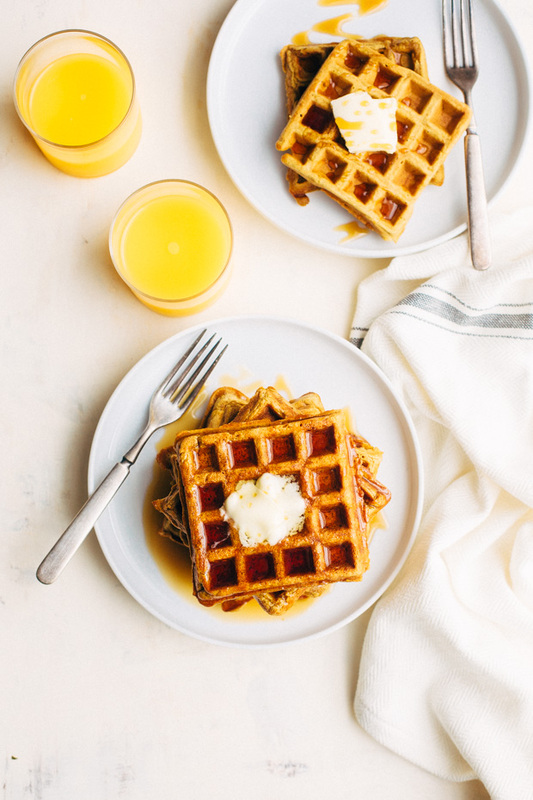 And though this is certainly not the end of the work week, I wanted to make your midweek a little more bearable with the prospect of enjoying the fluffiest buttermilk pumpkin waffles on the weekend. Grab the few ingredients you need and seriously, make this! Preheat the oven to 200ªF. Place a wire baking rack on a baking sheet, set aside. Preheat the waffle maker on the medium heat setting. In a medium bowl, whisk together the flour, baking powder, baking soda, salt, brown sugar, cinnamon, ginger, and nutmeg, set aside. 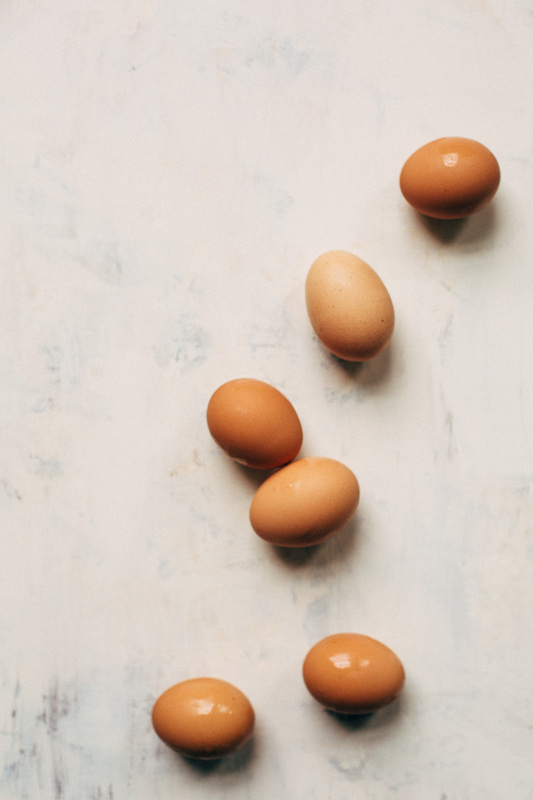 In a large bowl, whisk together the eggs, melted butter, buttermilk, pumpkin puree, and vanilla extract. Next, add the dry ingredients into the wet ingredients and fold with a rubber spatula, gently until JUST combined. Do not overmix. Spray the waffle iron with nonstick cooking spray. Pour about ⅓ cup of the batter into each waffle portion. Lower the temperature of the iron to the lowest setting and close the lid. When the light goes off (or it beeps) lift the lid gently to make sure things look okay. The waffle will be soft to the touch. Close the lid and let the waffles cook for a second round (or about 1-2 more minutes). Transfer the cooked waffles to the prepared wire baking rack and keep them warm in the oven while you prepare the rest of the waffles. Repeat making the waffles the same way. For serving, top with a pat of butter, maple syrup, whipped cream, or whipped honey butter! STORING DIRECTIONS: Waffles can be prepared and stored wrapped tightly in wax paper, then foil, and finally in a zip top bag. When you want to reheat, just pop ’em in a toaster! If you do not want to use buttermilk, regular cow’s milk, almond, coconut, or soy will also work with this recipe.